Overall Length – Like most fencing materials, the price of aluminum fencing depends on the length of the installation. Our materials are priced by the linear foot, and include everything needed for your installation. Pricing starts as low as $14.50 per foot for 4′ high residential grade panels. That’s highly comparable with any type of material. Prices, of course, are subject to change at any time, due to changing costs of materials. We’ll always quote the very best price available. Panel Height – The taller the fence, the more materials used in its constructions. Jerith aluminum ornamental fencing is available in heights from 3-8 feet. Choose the height you need for your particular application and let us give you a complete price quote on everything you need for your project. 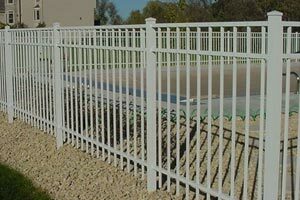 Aluminum Ornamental Fence Styles – Jerith manufactures a wide range of ornamental styles. From simple designs to styles to suit specialized applications, you’ll find an affordable fence to match your property. Each style is priced separately. Fencing Materials Grade – Jerith products are available in three grades, Residential, Aero, and Industrial. Each grade uses different dimensions and weights of materials to suit the application. Naturally, heavyweight Industrial grade materials are more costly. By choosing the appropriate grade for your installation, you can control your costs effectively. Aluminum Gate Choices – Matching gates are available for all styles and grades. The width and height of your gate affect its cost. Gates are sold separately from the panels. Let us assist you in choosing exactly the right gate for your project and quote you a great low price. Ask us about our free walk gate offer! Accessories – With all Jerith designs, a variety of accessories is available to help you customize your project. From decorative picket tops and post caps to scrollwork, you can choose exactly the features you want. All of these items are priced separately. We will be happy to give you a price quote for exactly the accessory products you need. As a high-volume purchaser of Jerith products, we receive maximum wholesale discounts from the manufacturer. That lets us pass our savings on to our customers. We know that by supplying outstanding quality products at prices that are highly competitive, we deliver true value to every customer. In addition, we ship directly from the manufacturer to your location to save you even more. Instead of paying twice for shipping, you pay only once. Our price quotes always reflect the maximum possible savings for you. As the leader in direct-shipped fencing products in the USA, we’re always looking for ways to save you money on the very best products on the market today. 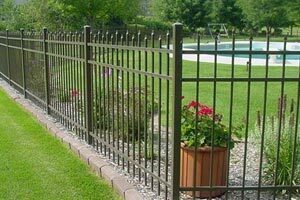 When it comes to aluminum ornamental fences, Jerith fencing, supplied by us, is your top choice. We encourage you to browse our pages to find the ideal Jerith fence for your project. When you do, please contact us for expert assistance, a complete materials list and the best price available anywhere. Ask us about our special offers and savings on shipping costs when you call. We look forward to helping you in every way.